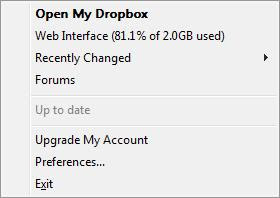 Over the last few weeks I've been using a product called Dropbox. This nifty little tool let's you sync up your files from anywhere and across multiple platforms. It's a perfect example of Cloud Storage in action. Keeping data in sync between multiple devices is a real issue. I use two laptops, a MacBook and a main PC on an almost daily basis. I don't always take the same machine with me but I always have a common set of files I need access to. I've tried various ways to solve my data synchronicity issues; Windows Offline Folders, portable hard drives and so on. These solutions fail for various reasons, the main one being the lack of a central automated repository where my data is kept. This is the issue Dropbox solves. Dropbox provides up to 50GB of shared "cloud" storage for storing data. This space is replicated onto a local directory (usually called "My Dropbox") on each machine that needs to access the shared storage. As files are created and amended, Dropbox keeps them in sync, uploading and downloading changes as needed. Obviously you need an Internet connection to make this work, but these days most PCs and laptops are 'net connected and changes are kept locally on disk until an Internet connection is detected. The interface itself is pretty cool. Have a look at the screenshots. There's an icon for the system tray and if you click it, you get a mini-menu showing the status of uploads and downloads. In my screenshot you can see I'm up to date and using about 81% of the free 2GB allocation. What's really neat though are the things you don't notice; uploads and downloads happen automatically and as groups of files are synchronised, a reminder window appears in the top right of the screen. Also, each file in the Dropbox is overlaid with a tick or a circle symbol to show whether or not it has been synchronised into the "cloud". See the third screenshot where one file is sync'd and the other is being uploaded. If the same file is edited on multiple machines before being synchronised, then they are stored with a suffix indicating the machine they came from, letting the user sort out update clashes. Without boring you in the detail, there's support for Windows, Mac and Linux plus a web interface; files are transmitted via SSL and stored using AES-256 security; you can also share files publicly and publish photos. I've installed Dropbox across 5 machines (one of which is a virtual Windows host under VMware Fusion) and have found the synchronisation pretty much flawless. At first I used only a limited subset of my main files, but as I've used the product more, I'm gaining more confidence in putting more and more data online. The only flaw I've found so far is that I can't put my Dropbox folder onto a network share. This is pretty annoying as my main machine at home only stores data on a central file server. I did however manage to get a Dropbox folder onto a machine where the network share was also an offline folder. Online services like this are not a replacement for sensible data management; in addition to storing data on a service like this you should still be keeping regular backups - (a) in case the service goes away (b) in case you corrupt your data. I'd like to see network shares supported as a Dropbox location. I'd also like to see the equivalent of VSS for Dropbox - so as I change or delete files I can recover previous versions. The free version of Dropbox comes with 2GB of storage. I've just about reached that and I'm considering upgrading to the paid service which gives 50GB a month (although I might do a bit of data re-organisation first!). Go try it for yourself and see how it improves your productivity; you can do cool stuff like move your "favourites" folder into Dropbox and share IE bookmarks between machines - the same goes for any standard folder link. This is the first of a number of products I'm reviewing. I'll be keeping a comparison checklist of all of them which will get posted as each product is reviewed. Dropbox already maintains a revision history of every file. You can right click the file, or view the history through the web interface. The revisions currently don't count against the quota. I notice that the revisions option doesn't integrate with Windows "previous versions" which is a shame. I've found Dropbox is very much a work in progress. They're regularly adding features. I'd be Windows previous versions integration will be there soon. NomaDesk is a file sharing software for business users who need constant and secure access to shared files. NomaDesk automatically syncs data across any computer – wherever, whenever. Please feel free to play around with our software and send me your feedback or share it with your readers. Where's All the Data Gone?